The Clinton Machine is unable to maintain online security and it supposedly is Russia’s fault. Well, Hillary Clinton obviously needed some excuse for twice failing to grab the political prize which her ostentatiously unfaithful husband snatched on the first try. Moscow is as good as any. If there was evidence of Russian tampering with voting machines, thereby literally stealing the election, then bring it on. But the claim that Moscow originally got the emails which eventually were released by Wikileaks, exposing the sleaze that we always knew surrounded the Clinton operation? That was a public service and media scoop. Anyway, Democrats were not always so sensitive about relying on Moscow’s political assistance. In 1983 the party was down on its luck. So what to do? Call on the Soviet Union for assistance! To be fair, we really don’t know what happened 33 long years ago when Sen. John Tunney, a California Senator and Kennedy intimate, passed a message to KGB head Viktor Chebrikov. All we have is the memo from the latter to Communist Party General Secretary Yuri Andropov, the former KGB head. Still, there really is no innocent explanation. Back when the Evil Empire finally collapsed the Soviet archives were opened for a time. Tim Sebastian, a reporter with the British Times, found the Chebrikov memo and wrote about it. Grove City College’s Paul Kengor included the document in his book, The Crusader: Ronald Reagan and the Fall of Communism. Since then a few conservatives have written about the event. It’s a story worth repeating. According to Chebrikov, “Kennedy’s close friend and trusted confidant J. Tunney” was visiting Moscow and had a message for Andropov. 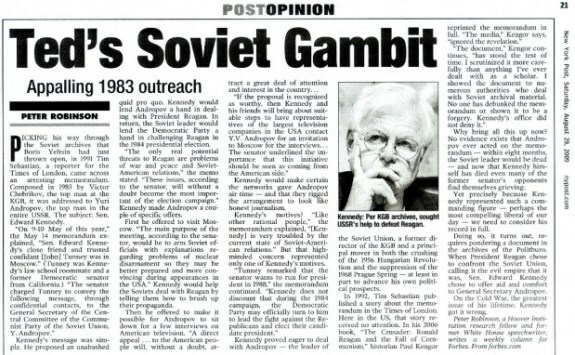 “Senator Kennedy, like other rational people, is very troubled by the current state of Soviet-American relations.” The situation could become more dangerous, mainly due to “Reagan’s belligerence, and his firm commitment to deploy” mid-range nuclear weapons to Europe. Criticism of Reagan’s foreign policy and approach to the Soviet Union was perfectly legitimate. Indeed, after reform Communist Mikhail Gorbachev came to power conservatives more often were upset with the administration. But treating Andropov & Co. as tragically misunderstood peaceniks was bad enough. To plan the entire exercise in an attempt to undermine Reagan’s reelection chances and promote Kennedy’s long-shot presidential ambitions was frankly outrageous. Yet today the left is upset because Russian hackers allegedly released information about the malfeasance of America’s would be leaders. Love or hate The Donald, he won because so many Americans were angry, frustrated, and fed up. Moreover, his chief opponent embodied just about every flaw of the country’s ruling class. Russia’s alleged role in the email leaks is a distraction. The most important issue is the development of Trump’s policy agenda for the next four or eight years.